These Joye 510 batteries are a match made in heaven for those who want their electronic cigarette to resemble a traditional cigarette as much as it feels like a traditional cigarette. These cigarette style batteries are complete with a manual activation button to control the vapor your electronic cigarette will produce. The Joye 510 battery is 180mah and will last a few hours before needing recharging. Just attach your atomizer, cartomizer or clearomizer and start vaping. 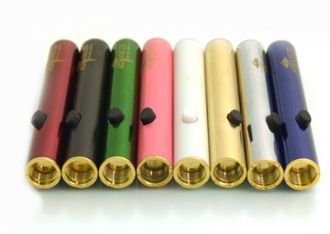 Joye 510 e Cigarette manual batteries available in: Black, White, Gold, Stainless Steel, Pink, Red, Green and Blue.